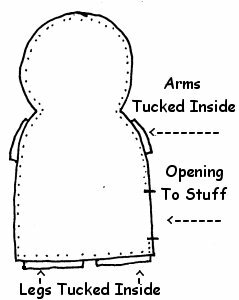 This pattern can be used to make any size rag doll. 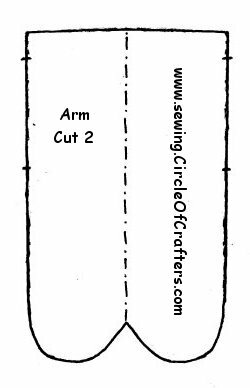 Printed at 100%, this pattern will make a 12" rag doll. Use a calculator to resize the pattern. For example, multiply 12 times 125% to see what size doll that would make. 12 X 125%=15, so printed at 125%, you would have a 15" rag roll. For an 18" rag doll, print at 150%(12 X 150%=18). Simply cut 2 of each of the 3 pattern pieces. 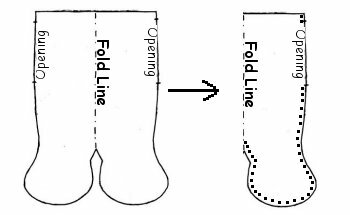 First, sew the arms and legs by folding each piece in half(right sides together) and then sewing along the dotted lines indicated below. Use a 1/4 inch seam. Leave an opening, to stuff, where shown. Next, turn each limb right side out. Now you will need to sew the head and bodice, attaching the arms and legs at the same time. 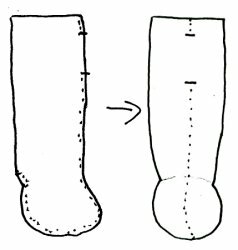 Pin the limbs in place(first turn them right side out) between your 2 layers of fabric, then sew along the dotted lines, using a 1/4 seam. 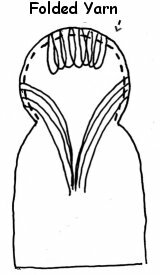 Be sure to turn the leg pieces so that the feet are facing forward. 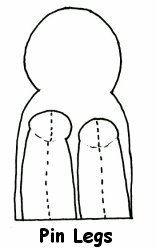 Next, turn the doll right side out through the opening. Use that opening to stuff the body and head use the opening in the arms and legs to stuff them. Hand sew the openings closed. You're done! Here are some face examples to help you. Draw the face lightly with a pencil. The eyes should fall along the line indicated below. After your doll is finished, paint over your drawn face with fabric paint(or embroider the face). 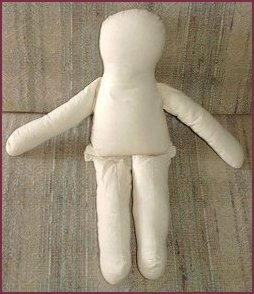 Making hair for a basic rag doll is easiest if your doll will be wearing a bonnet. 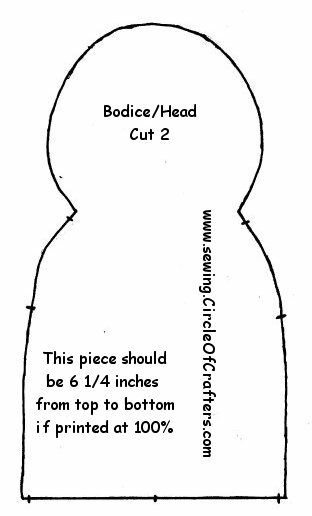 To make a bonnet, cut a circle of fabric about double the size of your doll's head(from top to bottom), cut 2. Next, sew the 2 pieces together, leaving an opening to turn it right side out. 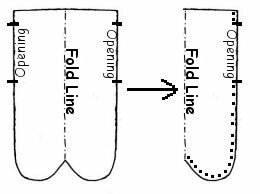 After turning it right side out, sew the opening closed and gather along the lines below(---- = gather line). The finished bonnet should look like the picture on the right. To make the hair shown above, cut strips of yarn for the bangs and pony tails or braids. As you are sewing the head together, sew the yarn in place(between the layers of fabric). ---- = the sewing line. To make a gingerbread rag doll, choose a light brown fabric. 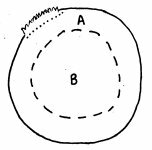 You won't need hair, instead just sew white ric rac where indicated below(before sewing the pattern together). 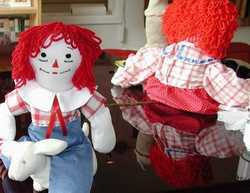 Raggedy Ann: Raggedy Ann's hair can be hand sewn after your doll is completed. 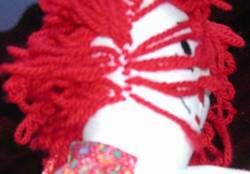 For the Raggedy Ann and Andy dolls in the photo use 2-foot lengths of yarn threaded through a large eye metal needle. Just use a single strand - not a double strand and no knot at the end. Pattern: Beginning at the doll's right jaw line work up around the face line to the left jaw line. The next arc of stitches goes in a row one quarter inch behind the front row beginning at the doll's left jaw line this time. Continue sewing rows moving back over head and side to side. Make the hairline across the lower head even with the jaw line. Begin at the lower right front jaw and work up and over to the left front jaw. Then add rows behind it to fill in the scalp. 1. Take a stitch, pull it tight, leaving a 2 inch tail hanging. 2. Take the 2nd stitch and rather than pulling it tight, leave it as a 2 inch long loop. 4. Take a stitch and rather than pulling it tight, leave it as a 2 inch long loop. Continue repeating the sequence of alternating one loose loop with one tight stitch. Use both acrylic or worsted wool. The dolls in the photo have acrylic wigs. Be sure your choice is washable, though.